Brazilica Festival will once again take over the city centre this weekend, excitement is building and the action is about to get hot. 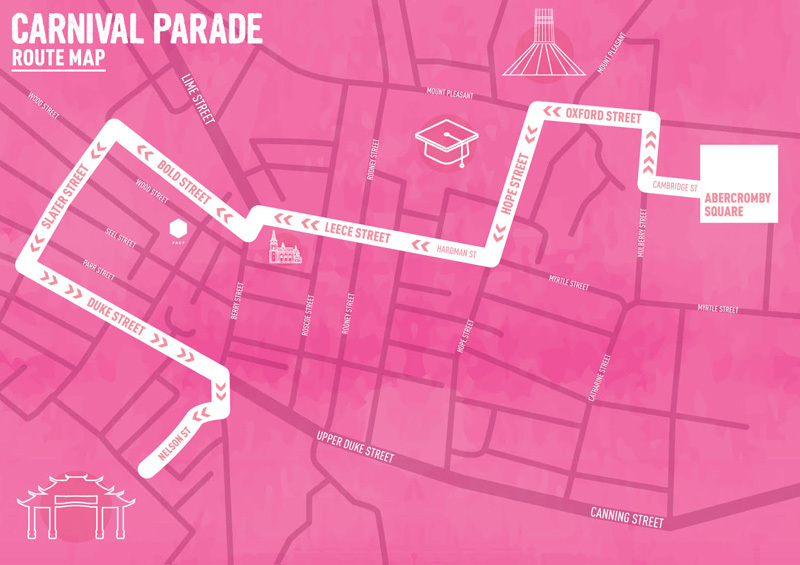 The main carnival day on Saturday 18 July 2015 from 20.00 will see a huge samba carnival parade travel through the city centre, filling the streets with colour, music and fun. Starting from Abercromby Square, the parade will turn onto Oxford Street and turn left on to Hope Street, the parade then turns right by the Philharmonic pub and will follow Hardman Street and continue on to Bold Street. This year, the parade will then turn left on to Slater Street, left on to Duke Street then right going through the Chinese Arch on Nelson Street to come to an end in Great George Square. The parade end is the perfect place for all involved to join the nearby after parties in the Baltic Quarter which will move between Constellations and District. Samba bands from across the UK and Europe are visiting to participate in the festival and the parade. There will be music and dance from an incredible 12 Samba bands, they are Paraiso School of Samba, Samba Funk Factory (France), Batucada Timbao (Paris), Liverpool Samba School, London School of Samba, Beat N Drum Belfast, Oya Batucada, Katumba, Merseyside Batala, Arco Iris, Wirral School of Samba and Hull School of Samba, this year’s parade will be the biggest and best capturing true Brazilian flare, colour and carnival spirit! Closing this year’s Brazilica, District and Constellations in the Baltic Quarter will host the carnival after parties on Sat 18 July from 10pm where the samba and Latin House vibes are set to keep crowds partying until 3am. A night set to be full of surprises, great music, dance and performances as we say goodbye to Brazilica for another year. Tickets for this amazing Brazilica send-off are just £5 with a wristband to swing between both venues, so be sure to join in for the carnival party of the year!